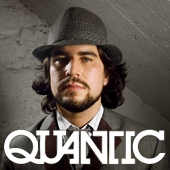 I discovered Quantic 4 or 5 years ago, when my musical taste first started shifting into down-tempo / trip-hop / lounge / esoteric electronica / whatever you want to call it. One of my all-time favorite musicians, Bonobo has been compared to Quantic, so it’s no wonder I was attracted to him. He records under various guises, notably, Quantic, The Quantic Soul Orchestra, and The Limp Twins. His music draws upon elements of cumbia, salsa, bossa nova, soul, funk and jazz. Holland plays guitars, bass, double bass, piano, organ, saxophone, accordion and percussion. Much of his sound is original composition with little in the way of sampling of other artists’ material.